Compliance jobs news is fast and furious this week. The compliance chief at Rio Tinto has jumped to a medical tech firm; Centene has a new head of compliance and audit. 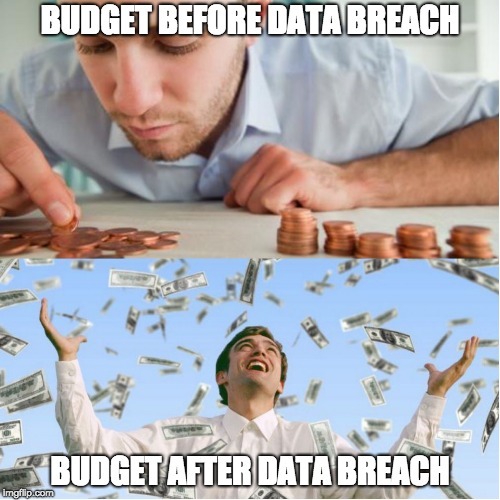 We have more compliance personnel moves at Celanese, Olympus, and elsewhere; plus a few interesting job openings, and our Meme of the Week goes out to all of you who have suffered through a data breach. Health insurance giant Centene Corp. has hired Matthew Snyder as senior vice president for internal audit, compliance, and risk management. Snyder comes to Centene from KPMG, where he was a partner for three years based in San Francisco. Snyder will report to CEO Michael Neidorff. Joseph Cox just picked up a new gig as head of internal audit for the Institute of International Education, a nonprofit in Washington that runs the Fulbright Scholars program and similar international exchange efforts. Cox was previously at the Public Company Accounting Oversight Board as associate director of financial operations. Down in Dallas, Abe Paul has been named vice president of internal audit for chemicals manufacturer Celanese Corp. Abe comes to Celanese from Kimberly-Clark, where he had been controller and director of internal audit. Barry Ronayne has been named financial controls and compliance specialist for PepsiCo, working in Ireland. He previously spent two years at Johnson Controls as senior manager for global ethics & compliance. Chris Briddell has joined AnMed Health, a hospital system in Anderson, S.C., as chief compliance officer. Briddell comes to AnMed from Adventist HealthCare Maryland, where he had been associate vice president for integrity and internal audit. Briddell succeeds Wanda Whitener, who retired. Olympus, maker of everything from cameras to medical equipment, has promoted its top U.S. audit executive, Richard Lebitz, to global chief internal audit officer. Lebitz had been running internal audit and risk functions for Olympus Corp. of America since 2015, and before that worked at Siemens since 2007. The Abu Dhabi Accountability Authority has promoted Rabih Elkhatib to head of the integrity and accountability unit. Elkhatib has been with the regulatory body in various roles since 2008. Michael Reilly, chief compliance officer at chemicals company FMC Corp., is being promoted to general counsel. He replaces Andrea Utecht, who is retiring. Reilly has been with FMC in various roles since 2002, chief compliance officer since 2016. No word yet on whether FMC will tap a successor CCO or Reilly will hold both titles. Huobi Group, a cryptocurrency exchange based in Singapore (ugh, cryptocurrency), has hired Elaine Sun Ye Lin as chief compliance officer. Sun previously ran Asia-Pacific compliance for State Street Bank from 2012 until December. Outcome Health, a healthcare technology company based in Chicago, has named John Vaughan its first-ever chief compliance officer. Vaughan comes to Outcome from Danaher Dental Platform, where he served as chief compliance officer since 2017. Earlier in his career he was at Genentech, Hospira, and other life science firms. Anzar Hasan is celebrating one year as an IT audit and governance professional at JCPenney. Sandra Moser, who stepped down as acting head of the Fraud Section at the Justice Department last week, is joining law firm Quinn Emanuel as co-head of its white-collar defense practice. Moser had worked at the Justice Department since 2006. This means Robert Zink, acting principal deputy chief, is the nominal head of the Fraud Section, although who knows how long that will be true with William Barr arriving as attorney general and Rod Rosenstein soon leaving as deputy AG. Norman Levine has left his job as lead for IT compliance and security at Black & Decker, to set up shop as a principal at consulting firm Cyber Risk Partners. Levine had been at Black & Decker for five years. Merger: Compli, a maker of software for HR compliance issues, just got acquired by KPA, maker of software for environmental, health, and safety compliance issues. No purchase price disclosed (drat), but it’s another example of GRC vendors buying each other up to expand product lines. Drexel University in Philadelphia is looking for a vice president of compliance, audit, and privacy. Recruiting firm handling the search is Major, Lindsey & Africa; send inquiries to Elizabeth long at [email protected]. USA Technologies, a payments business struggling with an internal investigation into sloppy accounting practices, just released a letter to shareholders. Says part of its improvement plan will be hiring a chief compliance officer and beefing up its program. Boston Energy Trading & Marketing is hiring a director of trade compliance. That’s all for the week ending Jan. 18. Enjoy the MLK Day Weekend; we could use more people like him in the world today. As always — if you have a tip or want to brag about your new job, promotion, career milestone, or anything else, email me at [email protected] or find me on LinkedIn. I’m always happy to give credit to the many hard-working people here in our corner of the business universe.